By using Google Drive and iCloud, it is so easy for you to keep daily backup of your WhatsApp account. And when you transfer WhatsApp from old Android to new Android or from old iPhone to new iPhone, the new phone will automatically restore the backup during the installation of WhatsApp. But how about transferring WhatsApp messages between Android and iPhone? Does switching from Android to iPhone, or from iPhone to Android mean you will lose your WhatsApp data? Thankfully, there is always a way out of the deadlock. More precisely, there are three main ways to resolve the difficulty. All you have to do is to check them out below, and you will have your WhatsApp chats transferred over. In this part, there are two methods that will be introduced to you and the first method requires you to have a computer, if you don’t have one, you can directly jump to the second method. Never be afraid of losing WhatsApp chats even after switching from Android to a brand new iPhone X. There are many methods and tools can help. 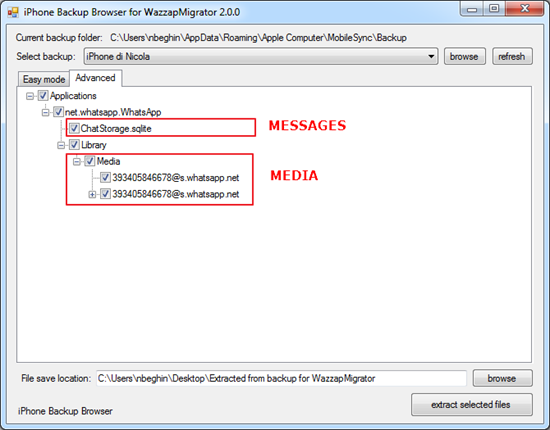 For example, you can use this WhatsApp Transfer tool to migrate WhatsApp chat history, photos and voice messages, and those files will remain intact after being transferred. 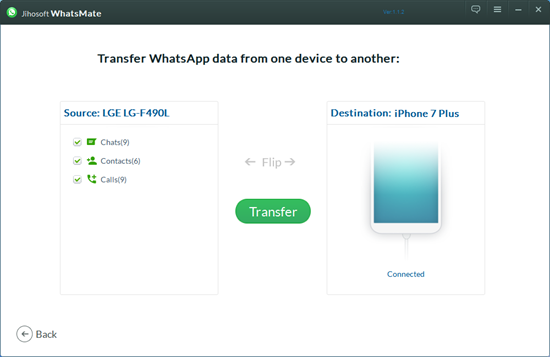 Because this software offers users a direct way to safely and stably transfer WhatsApp data between Android and iOS devices. Note: This software is a Windows-based program, and supports identifying almost all kinds of Android and iOS devices, such as Samsung, HTC, LG, Sony, Motorola, Nexus, Huawei, OnePlus, iPhone X/8 Plus/7 Plus and etc. Step 1. Choose the Transfer WhatsApp mode on the program interface. Step 2. Connect both your Android and iPhone to the computer via USB cables. Step 3. Wait for the program to identify your phones, until they successfully appear on both side of the program interface. By the way, you can use the Flip button to shift their positions. Step 4. 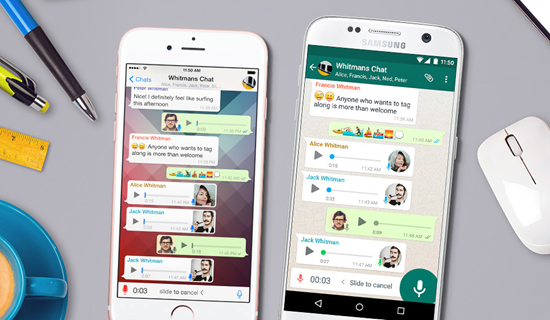 Select Chats from the left panel, and hit the Transfer button to transfer WhatsApp chat history from Android to iPhone. Step 1. 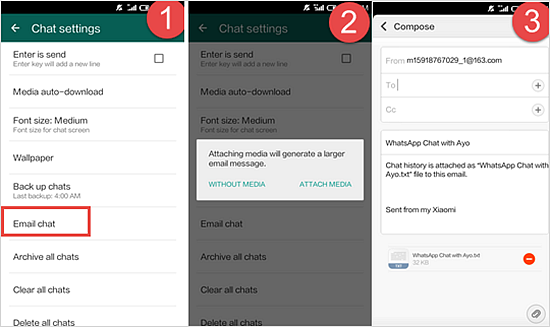 Go to your WhatsApp Settings > Chat Settings, and tap on Email Chat. Step 2. When a pop-up window appears and asks if you want to attach WhatsApp media, please make your decision based on your needs. Step 3. After that, you are required to enter the sending and receiving mailbox address. Step 4. Once the email has been sent, you can then check your mailbox and download the .txt file of WhatsApp message history or the WhatsApp media on your iPhone. Now, Android to iOS transfer is no longer infeasible, while the ways to copy WhatsApp from iPhone to Android vary in difficulty. This method is somewhat complicated and involves two different tools. You need to install iPhone Backup Browser on your computer and download WazzapMigrator app on your Android device. If you think this method is too hard for you, we strongly recommend you use the one-click WhatsApp Transfer solution in the first method of Part 1. Note: The free version of iPhone Backup Browser only allows you to pull text messages from iPhone backup. If you want to extract all the data from iTunes backup, you should purchase the full version. Step 1: Using iTunes to create a complete backup of your iPhone on the computer, and please remember to disable the “encrypt iPhone backup” option in iTunes before you create the backup. Step 2: On the computer, launch the iPhone Backup Browser and let it loads your iTunes backup file. Then select the backup you just created. Step 3: Click on the (-) sign until you find the net.whatsapp.WhatsApp folder. Under this folder, find and extract a file named ChatStorage.sqlite which stores all the text conversations of WhatsApp. 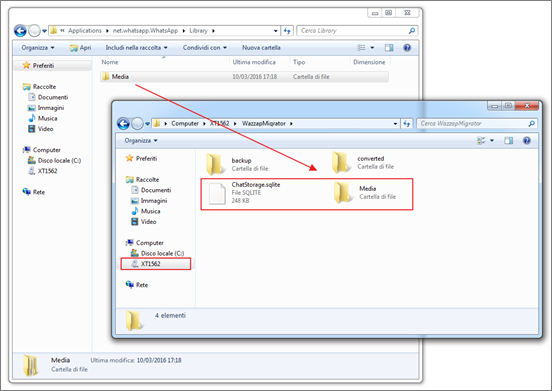 For media backup, you should select and extract all the files under the Media section. 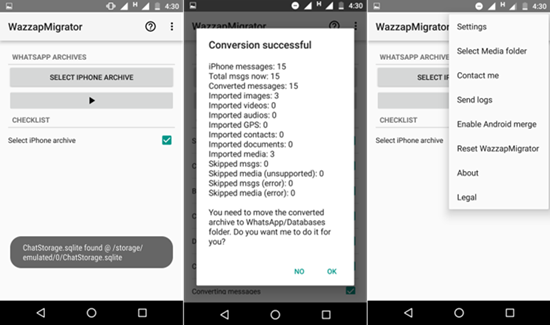 Step 4: Then move the extracted files from your computer to the WazzapMigrator folder inside your Android internal memory. Step 5: Run WazzapMigrator on your Android phone. After it automatically detects the extracted files on your Android, you can tap the “Play” button to let the app make those files into a local WhatsApp backup. 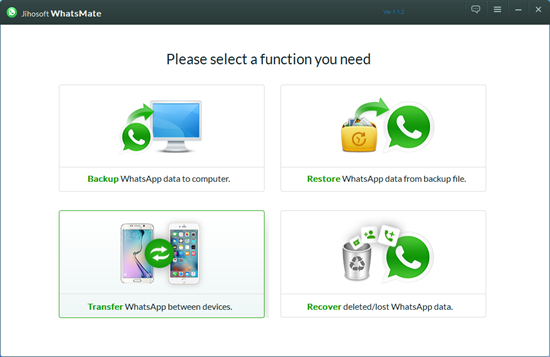 Step 6: Finally, you just simply install WhatsApp on your Android and restore WhatsApp from the local backup that created in the previous step.